Who knows why they called it Relic, back in ‘97 when real-time strategy was on top of the world. The name’s only become more fitting as time has whittled away at the genre, though, leaving just a handful of household studios to keep alive the joy of drawing a green box around a gaggle of tiny people. 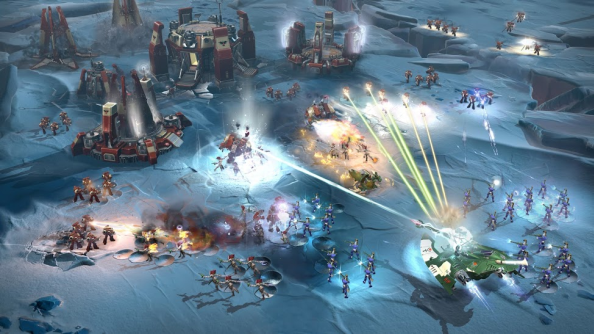 Read more: the best strategy games on PC. 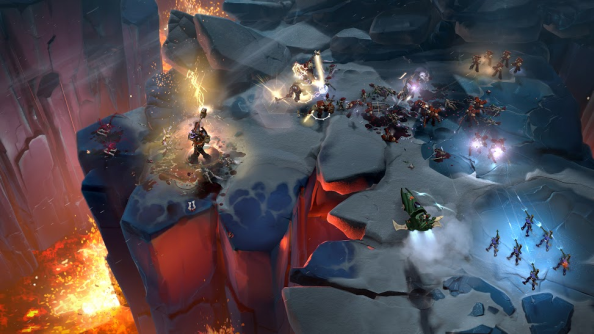 The Dawn of War series has thrived in adversity, first adapting to a landscape that had lost interest in base-building, now returning to a genre swallowed up by the MOBA. It’s survived studio structural change too: for a while during the messy disassembly of THQ, it looked like Dawn of War 3 might not happen at all. It seems as if Sega’s acquisition of Relic was nothing but good for the studio. Its European division had built a strong stable of PC strategy developers, and the studio was able to borrow Creative Assembly general manager Tim Heaton to provide some direction. Heaton helped ship Company of Heroes 2 and appointed Justin Dowdeswell, who remains Relic’s studio director today. 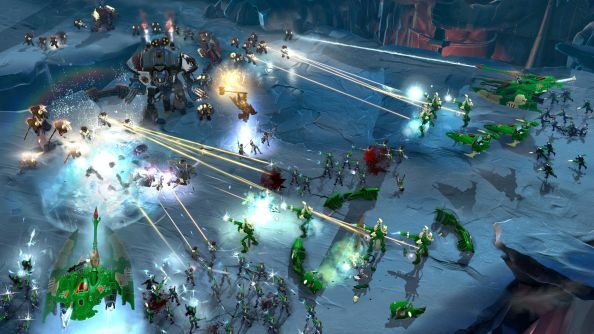 The team who had been working on a nascent Dawn of War 3 under THQ had a chance to step back under new guidance. Work began again in earnest two and half years ago, and by the time Disbrow joined in 2015, the team had a “full head of steam”. Their job was to reinvent a game that had already been reinvented once. Dawn of War 2 had been a fairly radical take on its source material, zooming in close to create something that was half RTS, half action-RPG. It was wildly successful, but player feedback suggested to Relic that base-building was missed. It’s a delicate operation – or as delicate as anything can be in 40K. With spectacle comes complexity, and Relic intend to ramp that up slowly over the course of Dawn of War 3’s campaign. 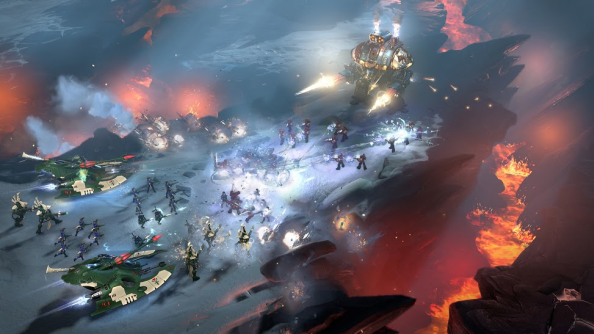 Over the course of the campaign, we’ll come to understand the relationship between the various parts of a Dawn of War 3 army; the player-built bases that pump out line units, which can in turn bolster the game’s elite heroes. Bases weren’t the only central element of Dawn of War 2 that had to change. That game was indebted to Company of Heroes in its cover – a positional system of damage reduction that defined the way your units moved about the battlefield. Even by the release of 2011’s Space Marine, however, Relic had a new mantra: “Space Marines don’t take cover”. The team settled on the notion of heavy cover – simple, defensible emplacements that are only good so long as they’ve got health. Ranged enemies are forced to sit back and plug away, but anyone with a chainsword can go in swinging. Dawn of War 3 comes during an incestuous period in strategy gaming. Though in the beginning MOBAs grew out of Warcraft, RTS developers are taking bits back – Relic included. Yet despite the creeping influence of eSports, Relic still feel compelled to fly the flag for the elaborate single-player campaign. 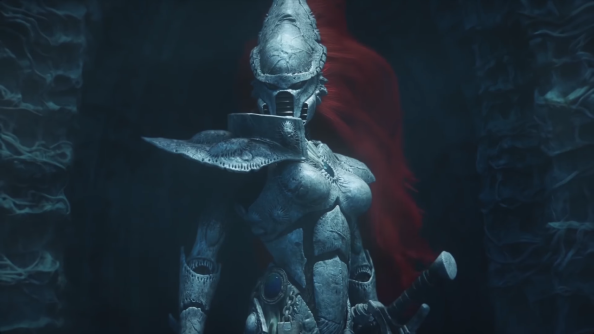 Each of Dawn of War 3’s three factions – the Space Marines, Eldar and Orks, picked for their popularity in previous games – will have its own named hero. The plot will flit back and forth between each of their perspectives, mission by mission. Relic aren’t talking Dawn of War 3 multiplayer yet, but it definitely exists. Disbrow speaks often about counterplay – ensuring, for instance, that an incoming orbital bombardment is something your opponents can react to. “When we had orbital bombardment that only hit in one place, but had a big tell in front of it, people just ran away,” Disbrow remembers. In the game’s current build, the bombardment is a brilliant blast of light that pierces the battlefield – before drifting dangerously back and forth with the movements of the player’s mouse. Like everything else in Dawn of War 3, it aims to marry spectacle and strategy. “We’ve iterated a tremendous amount to date,” says Disbrow. “At some point hopefully we’ll have external people coming into play, and then we’ll probably have to upend the table and restart a bunch of it.